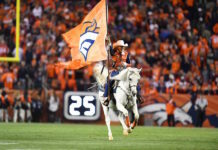 2018 Season Review: How do the Broncos move on from Shaquil Barrett, Shane Ray? Shaq Barrett celebrates a sack. Credit: Mark J. Rebilas, USA TODAY Sports. 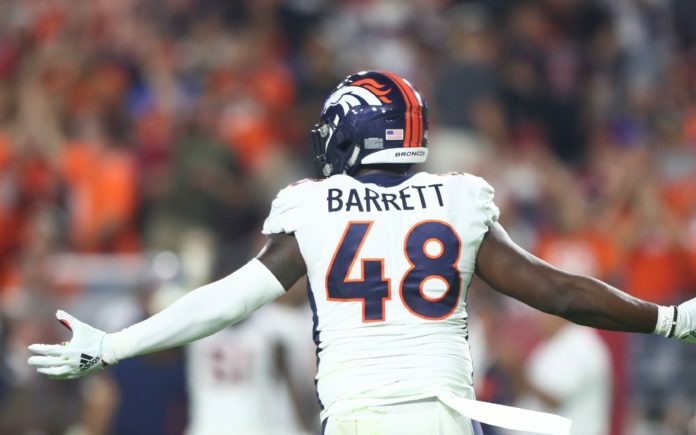 The Broncos have been gifted the luxury of having three, arguably four, high-end edge rushers in Von Miller, Bradley Chubb, Shaquil Barrett, and Shane Ray, when few other teams even have two. 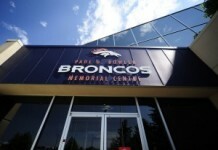 That luxury appears to be one the Broncos will be unable to keep as they focus on rebuilding this offseason. Miller was his typical self in 2018, racking up 14.5 sacks, good for fourth-best in the league. Miller also helped Chubb record 12 sacks during his rookie year, a franchise record and the fifth-most all time. At this point, Ray and Barrett, will be free agents this offseason unless they are re-signed by the Broncos. The odds of either returning seem slim at best. Ray has been disappointing for the most part since being drafted in the first round of the 2015 Draft. Often sidelined by injury, and not productive enough when healthy, the Broncos will likely let Ray walk. So, with Ray and Barrett on the way out, how will the Broncos maintain their deep stable of edge rushers? Luckily for the Broncos, this mass exodus of pass rushers from the roster couldn’t be happening at a better time. They already have Jeff Holland, who made the roster as an undrafted college free agent like Phillip Lindsay, coming off a solid rookie year that saw him take Ray’s spot in the rotation by season’s end. They also have a sea of free agent alternatives this spring. The group of edge rushers set to hit the open market this year is among the best in recent memory. Jadeveon Clowney, Ziggy Ansah, Demarcus Lawrence, Frank Clark, and Dee Ford will be the hottest names, but Cameron Wake and Clay Matthews are worth mentioning too. The Broncos likely won’t target any of these bigger name free agents at edge-rusher because they need depth instead of starters, but the abundance of talented pass rushers should help Denver find that depth at a discount. Guys like Jeremiah Attaochu and Pernell McPhee could excel in rotational roles for the Broncos and likely wouldn’t be expensive, allowing the Broncos to focus elsewhere in the draft. Despite the free agent market, the draft may be the best place for the Broncos to find their replacements for Ray and Barrett. The 2019 draft class is flush with pass rushers. In Daniel Jeremiah’s latest mock draft for NFL Network, he had an edge rusher go first, second, and third overall. Meanwhile, Bleacher Report’s Matt Miller slotted three of the first four picks as edge rushers, and six of the first 13. This draft isn’t top-heavy either. In fact, Matt Miller believes the strength of this draft lies in its depth. There should be plenty of options available for the Broncos on day three to find a rotational pass rusher if they so choose, whether it be Clemson’s Austin Bryant, Wyoming’s Carl Granderson, or even TCU’s Ben Banogu. The Broncos’ top priority this offseason should be adding high-level talent wherever they can throughout the roster. With limited cap space, the Broncos should spend their draft picks and big free agent money on positions of greater need. If the Broncos are able to sign a linebacker, a cornerback or two, and an offensive lineman in free agency, drafting an edge-rusher at some point on day two or day three of the draft would be a fantastic option. 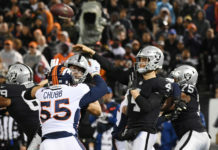 However, if the Broncos are only able to fill one or two of their needs in free agency, then they should target a cheaper pass rusher in order to maintain their rotation. The Broncos should also give Jeff Holland the opportunity to win the number three job behind Miller and Chubb. He showed great potential in his first season and it is worth determining quickly if he can build on it.